If Washington and Beijing can get out of their own way, they can combat a common threat. While President Donald Trump has expressed optimism about his relationship with President Xi Jinping, U.S.-China relations seemed to have cooled because of tension over the North Korea nuclear issue as well as Trump’s call for an investigation into China’s trade practices. But Washington and Beijing will need to also focus on prioritizing areas of shared interest ripe for cooperation – and Somalia is a compelling case – if Trump and Xi Jinping are going to make “bad problems go away” anytime soon. This is particularly important for Somalia, a country that is significant to Trump’s top foreign policy goal of defeating violent extremism and key to global trade and regional security in East Africa. Terrorist attacks orchestrated by the al-Qaeda backed al-Shabaab and famine brought on by a severe drought earlier this year are major challenges to the Somali government, which may now be facing a re-emerging threat: piracy. We have seen an uptick in piracy incidents in the Gulf of Aden during the first half of this year, a common threat to U.S. and Chinese interests in Africa. According to the International Maritime Bureau (IMB), five piracy incidents occurred during the second quarter of this year, including a high-profile hijacking of an Indian cargo dhow in April, in addition to other reports of vessels being fired upon or boarded by pirates. This may seem to be an insignificant number of incidents, but it is a sizable jump from zero hijackings reported last year. Relaxed security measures, including the end of NATO’s anti-piracy mission in the region, along with Somali fishermen’s frustration with illegal fishing competition­ may explain piracy’s re-emergence. While China’s doctrine of non-interference, clashing perspectives on democratization, and competition for influence in Africa have impeded some cooperation on African security in the past, the United States and China have made progress in using bilateral and multilateral mechanisms to address non-traditional security threats in Africa. The Africa-China-U.S. consultation convened by the Carter Center last year is an example of such progress – a rare occasion in which American, Chinese, African, and European government officials and experts came together to discuss African maritime security and piracy. 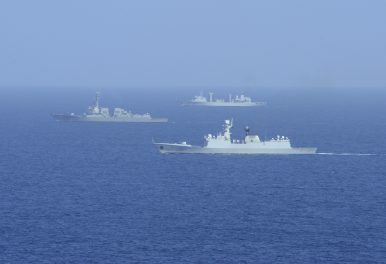 The United States and China also conducted their most recent joint counter-piracy exercise in the Gulf of Aden in December 2014, which brought together 700 American and Chinese naval personnel. The U.S. Navy (USN) and People’s Liberation Army Navy (PLAN) conducted extensive training on search and seizure protocol and aimed to improve communication between the two navies. The United States and China will have to continue to look pass areas of contention to effectively confront complex, and evolving transnational threats. The United Nations and United States are investigating a possible link between al-Shabaab and Somali pirates, who are believed to be using militant-controlled territory in exchange for transporting small arms and ammunition for the extremist group. Pirates have paid rent to al-Shabaab in order to use ports in southern Somalia in the past, but using pirates’ vessels as conduits for transporting arms by sea presents a new kind of challenge that fuels maritime insecurity. The cost of Somali piracy was $1.7 billion last year and the al-Shabaab threat has long spread beyond the borders of Somalia into neighboring countries. Considering the United States and China’s common interest in peace and security in Africa as well as their capacity to contribute to maritime safety measures as major sea powers operating in the region, these countries must take the lead in advancing maritime cooperation. If Trump and Xi continue to build on past U.S.-China joint exercises and multilateral dialogue on African security, this will have a far-reaching impact. The most obvious result of prioritizing bilateral security cooperation is that the Gulf of Aden, a key trade route through which one-third of the world’s commercial ships transit, will be secured. In addition, U.S.-China security cooperation in Africa could also form a foundation for maritime cooperation in other parts of the globe, including Southeast Asia, a hotspot for piracy. Maritime cooperation in Africa can be the driver for the tremendous progress in U.S.-China relations that Trump and Xi set out to achieve earlier this year. If the two leaders succeed in making counter-piracy a top priority, they will be doing more than crossing problems off of a list – they will create a solution-based agenda and establish a framework for military-to-military relations for greater joint initiatives going forward. Brittney Washington is a former researcher at the Center for a New American Security in Washington, DC. The Chinese Ministry of National Defense clarified the extent of the Chinese Navy's anti-piracy operations in the Indian Ocean.